This entry was posted in .NET, Free, LifeHacks, Tools. Bookmark the permalink. ← Can you spot a bug? Thanks for using the Twitterizer library! Great idea using launchy, I’m excited to start using Twitt.Poster. FYI: I’ve updated the license to use the New BSD license. Have fun! By the way, you don’t need to copy the twitterizer classes into your project. 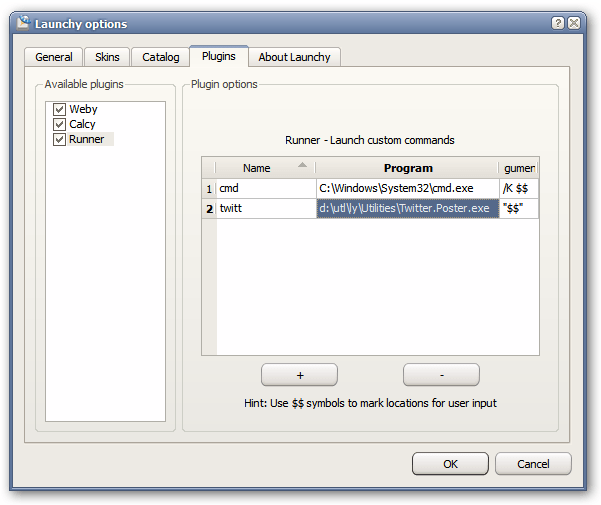 Instead, build the Twitterizer.Framework project and use the .dll it builds as a reference in your project. I didn’t really want to drag another .dll with the app, or use IlMerge for something so simple. This is a proof of concept, rather than production quality code. If there’s a demand to improve it, I actually might some day (like do it the ‘right way’, as an actual plug-in to Launchy). By the way, I’ve been using Twitt.Poster and it works great and saves a ton of time! Downloaded the zip file and followed all the steps to set up Runny but did not find a Twitter.Poster.exe file in the zip package. There is a Twitter.Poster.csproj file. Any advice? Thanks in advance. Hi, thanks for useful article. I did your instructions exactly as above article, i installed latest version Launchy, compile your app source within VS2008 Express Edition and then i add the path as a new plugin to launchy, i also provided my user/pass within config file. Every thing looks fine but no post appears on my twitter page. i tried many times but no change. Do you have any idea about the problem? Do you have a space character in your path? If that is the case, it may be the reason why Launchy is not picking up the poster app. It was my fault not the space in my path or any thing else, your solution worked perfect. I was addressed wrong executable. Twitt.Poster solved my other problem too. i was using “curl” for twitting and it couldnt post in Unicode but Poster solved it. i was twitting for a few days with no errors, then what causes this error? No idea what might be the cause. I just checked, and for me it works perfectly fine. Does it happen everytime you twitt? Can any one help me in creating account with twitter using twitter API. I want to add this functionality in my application that new user can create their account on twitter from my own UI. Just thought of the idea of updating via Launchy, glad to see that you have made this possible. The Binary version was a huge time saver too. This is an interesting concept. What are your thoughts on a standalone launchy like application for Twitter like samuelhaddad.com/software-projects/twittertalk/ for people who don’t use launchy? Would love to Tweet from Launchy but I can’t seem to download the binary tool. The download link doesn’t seem to work and I have no idea how to compile it myself. Haha, well I found the download link in the comments that worked. Followed your instructions and my tweets are showing up on Twitter. But, after every tweet I get an error about being unable to parse Twitter response. Anything you might suggest I check? That’s probably some change in the Twitter API. I would have to update to the newest version of Twitterizer.